The new governor in Freedom From Religion Foundation’s home state has started his tenure with a major state/church misstep, causing FFRF to formally complain. May we all bow our heads. God our father, we thank you for your grace and mercy toward us. . . . God, I ask that you invoke [sic] your richest blessings on him and his administration as he assumes the mantle of leadership of this state. . . . Give us the strength to stand with our leaders, the courage to encourage them, and continue to pray for them because we know that this journey is not easy. And we must, with those who wait on the Lord, shall renew their strength, they shall mount up with wings like eagles, they run and not be weary, they shall walk and not faint. When Jesus washed, he washed my sins away! Two more religious songs, including “He's Our Hope,” about Jesus, were performed, also repeating religious lines over and over. After the Christian invocation and Christian gospel choir, even the ordinarily banal inclusion of “God bless” by various speakers contributed to an overall impression that the event was intended mainly as a celebration for Wisconsin Christians. The religious overdose sent a clear message to nonreligious Wisconsinites that we were not a part of the event, Barker and Gaylor state. This is particularly distressing and frustrating, given that 24 percent of Americans today are nonreligious. Further, more than half the residents of Dane County — the seat of which is Madison — are nonreligious. 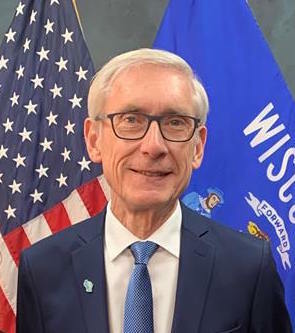 As governor, Evers took an oath of office to uphold the U.S. Constitution, which is a godless and secular document in which the only references to religion in government are exclusionary, such as the prohibition on religious tests for public office, FFRF reminds Wisconsin’s new chief executive. The federal and state constitutions dictate that the gubernatorial office may not insert religious rituals into government-sponsored events, including inaugurations. FFRF is urging the governor’s office in the future to honor our secular form of government and keep divisive and unnecessary religion out of state-sponsored events. The Freedom From Religion Foundation is a Madison-based national nonprofit with 31,000 members, including more than 1,700 in Wisconsin. FFRF's purposes are to uphold the constitutional separation between church and state, and to educate the public on matters related to nontheism.